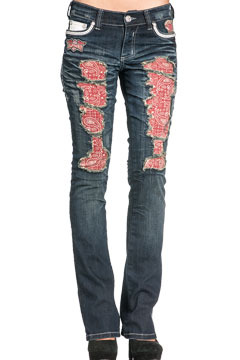 Affliction Jade Drifter Rome premium bootcut women's jeans in Dark Blue Vintage Calcified Wash. The front features heavily distressed holes with the a red and white paisley pattern underneath that creates an edgy look. Premium denim with back flap pockets accented with white and red accents. Round metal studding accented on the back. Slim fit through hips and thighs. Also includes custom cross buttons, custom cross rivets, and leather jean patch. Made in USA. Deconstructed by hand. All sizes have 34" inseam. 7" rise. 98% Cotton 2% Spandex, 11oz Ringspun denim. Color: rome dark blue wash.